Contact us to purchase today. The autosensLED™ is the perfect solution for illuminating the interiors of safes, cabinets, closets, drawers, lockers, luggage, or just about any place that is dark when closed. Using a patent-pending ambient light sensing technique, the product continuously monitors the environment ambient light. Once even a small amount of room light is detected, the autosensLED™ activates, uniformly bathing your compartment in light. With ambient light sensing technology, you never again need to worry about your batteries dying because you forgot to turn off the lights. Forget to close the door? No problem—the autosensLED™ will turn itself off after five minutes. The premium LEDs used provide a bright white light that will accurately illuminate all colors. A durable acrylic housing adds soft diffusion to spread light into every corner of your compartment. We package the autosensLED™product in a oversized tube that includes everything you need to immediately start enjoying your product. Inside you will find a mounting clip, instruction sheet, and batteries. The product operates on three standard AA batteries (included!) and has a typical operating lifetime of over two years! The secret lies in the patented technology that only activates the LEDs when it detects you have opened the door. Five ultra efficient white LEDs produce a bright, uniform glow that consumes less than a single watt of power that will be more than adequate for just any size compartment. Light sensing is highly reliable. Motion sensors can be overly sensitive or very insensitive meaning that they turn on when they are not supposed to and drain batteries too soon, or they don't come on without excessive waving of hands in front of them. You can install multiple autosensLEDTM lights inside the same compartment. The first autosensLEDTM to activate will cause all the others to turn on as well. Mounting options for the autosensLEDTM are more flexible than for a motion controlled light. Just place the light anywhere near the compartment opening that room light will hit when the door opens. For motion sensors, you need to strategically position the motion sensor to detect the door swing or a hand moving inside. You can trigger your autosensLEDTM on with any IR remote. The light sensors are tuned to visible and infrared light meaning that any color of light including invisible light that comes from your TV remote can be used to trigger the LED light on. Highly sensitive light detectors are located in multiple locations around the autosensLEDTM product. This ensures that no matter how you orient the product in your compartment, it will detect even small amounts of light that fall on its surface. The autosensLEDTM comes with a metal mounting clip. This clip can be attached to any surface using the included foam tape. Alternatively there are two holes in the clip that allow for mounting with wood screws for more permanent installations. The product can be used as a handy flashlight. Simply remove the tube from the clip to direct the light where you need it. 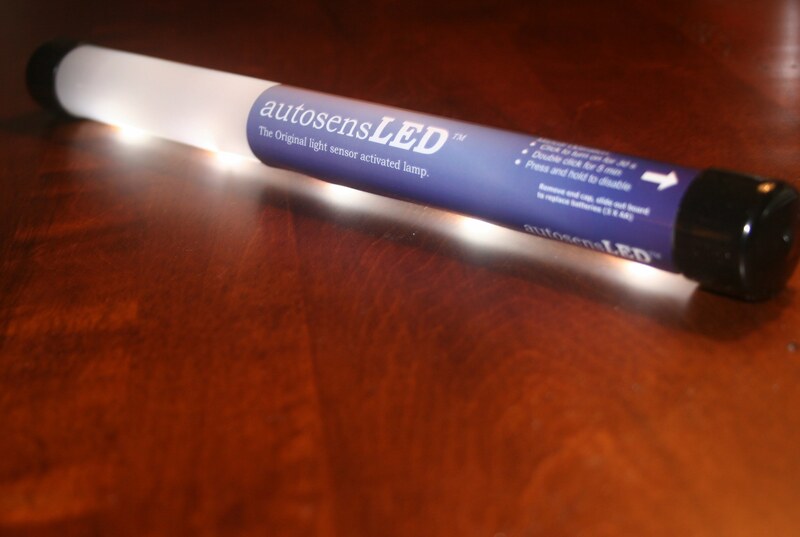 By pressing the end cap of the tube, you can manually turn on the light for thirty seconds. If you double click the end cap, the light will remain on for five minutes.